One of the most common injuries suffered by elderly nursing home residents is a bed sore or pressure sore (also referred to as a pressure ulcer or decubitus ulcer). Families with loved ones in nursing homes should be aware of what is a bed sore and the risk factors for developing bed sores. What is a Bed Sore or Pressure Sore? A bed sore, pressure sore or decubitus ulcer is generally defined as any lesion caused by unrelieved pressure that results in damage to underlying tissue. 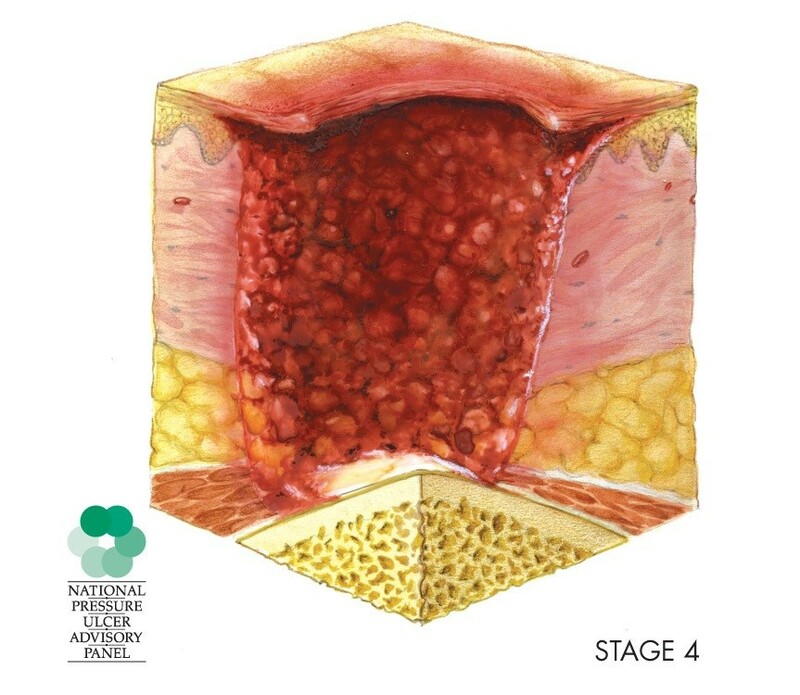 It is typically a circumscribed area in which skin tissue has been destroyed due to the restriction of blood flow to the area because of excessive and/or prolonged pressure. The most common sites of pressure sores are over the so-called boney prominences, the coccyx or sacrum (tailbone), hips, heels, knees, ankles, and elbows. Pressure sores are “staged” to characterize their severity. 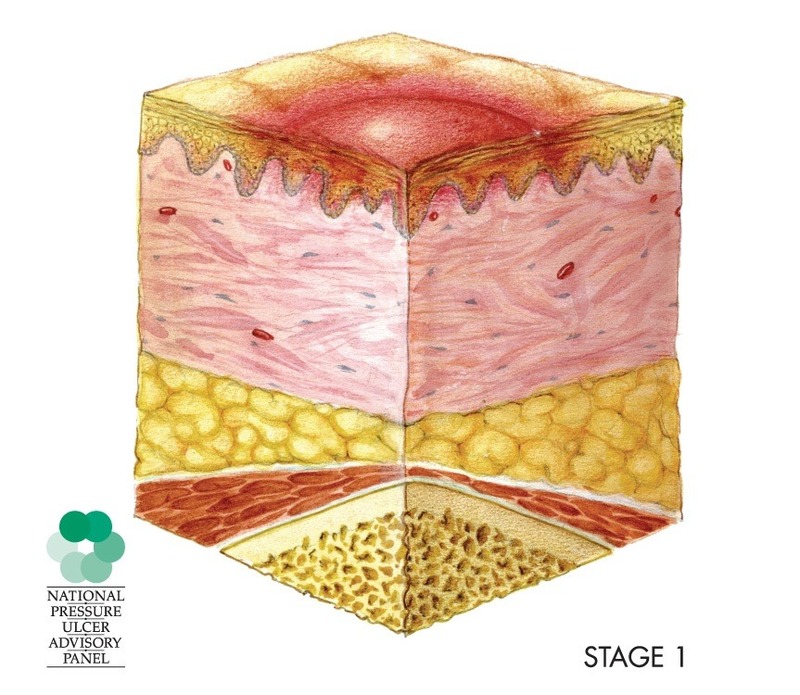 The following criteria can be used to quickly identify pressure ulcer wound stages, going from the least severe Stage to the most severe Stage. 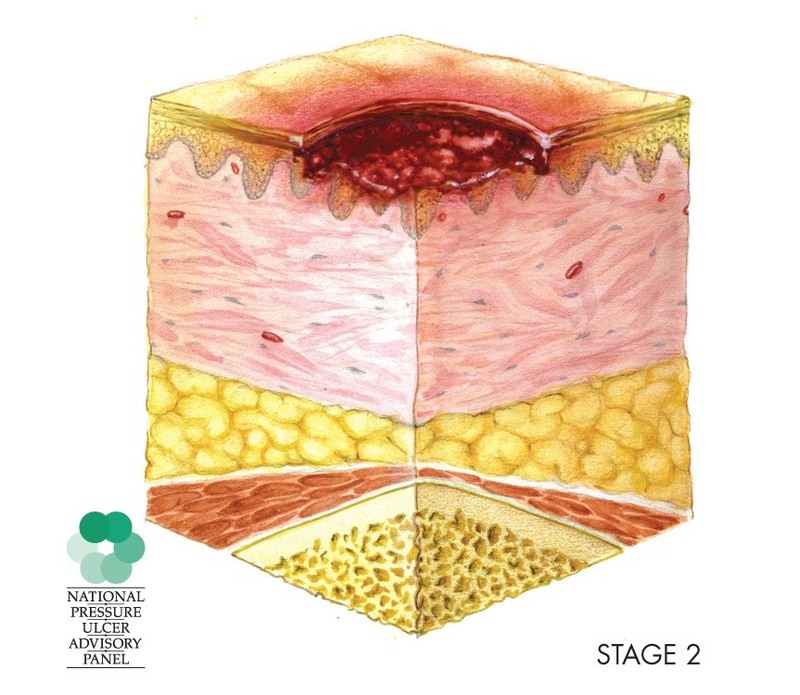 The National Pressure Ulcer Advisory Council has prepared illustrations of normal skin and the different Stages of pressure sores, which are linked below. Stage I Pressure Sore - Nonblanchable erythema (reddening) of intact skin. The epidermis remains intact. 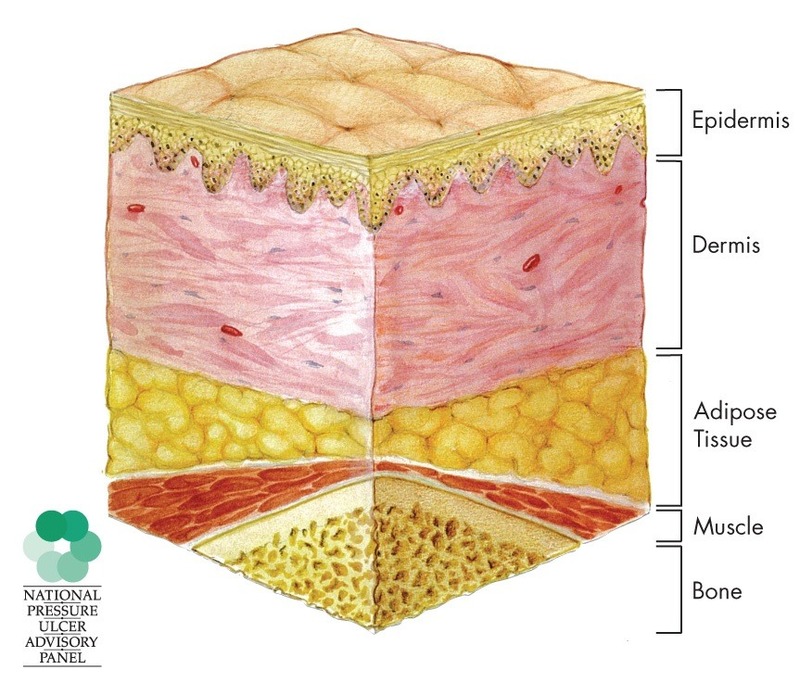 Possible indicators: reddened, darkened or discolored skin, warmth, edema (swelling), or induration (hardness of skin). For persons with darkly pigmented intact skin, assess for reddening and/or inflammation with localized changes in skin temperature. A Stage I pressure sore is an indicator for more frequent repositioning, and the use of a pressure reducing device. 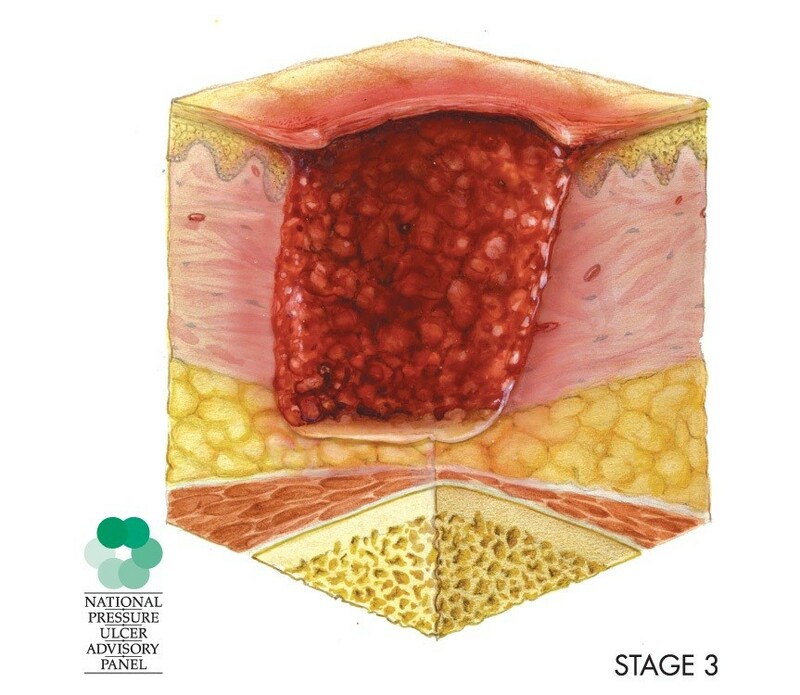 Stage II Pressure Sore - Partial thickness loss of skin involving epidermis and/or dermis. The ulcer is superficial and presents clinically as an abrasion, blister, or shallow crater. Stage III Pressure Sore - Full-thickness tissue loss involving damage to or necrosis of subcutaneous tissue that may extend down to, but not through, underlying fascia. The ulcer presents clinically as a deep crater with or without undermining of adjacent tissue. Stage IV Pressure Sore - Full-thickness tissue loss with extensive destruction, tissue necrosis or damage to muscle, bone or supporting structures (e.g. tendon, joint capsule). Undermining and sinus tracts also may be associated with Stage IV pressure ulcers. Pressure sores are painful. If untreated or treated inadequately, pressure sores can lead to infection, gangrene, sepsis and ultimately, death. Outside wound care by experts and surgery, such as a skin graft, are often necessary to try to heal the most severe wounds. How are pressure sores prevented? The first step is to relieve pressure. The nursing home resident with impaired mobility must be repositioned at least every 2 hours. This 2-hour requirement is not restricted just to those residents who are confined to bed. The need for repositioning applies also to time spent out of bed, whether it be in a wheelchair, geri-chair or on a sofa. The second step in the prevention of pressure sores, particularly for those residents who are bed bound, is to provide appropriate pressure-relieving devices. Examples of such devices include air mattresses, air-fluidized beds (e.g., Clinitron bed), low-air-loss beds and soft foam heel pads or boots. Many nursing home residents are incontinent. Urine and feces can burn the skin and contribute to skin breakdown. Thus, another step in the prevention of pressure sores is prompt incontinent care. It is recommended that pericare following an incontinent episode be provided within 15 minutes. Complaints by family members that bed sheets are routinely wet or soiled whenever they visit their loved one in a nursing home is an indication that appropriate pericare is not being administered in a timely manner. Proper nutrition and hydration are also necessary to prevent skin breakdown and promote healing once skin breakdown has occurred. More often than not, residents who are admitted to hospitals suffering from Stage III or Stage IV pressure sores are also diagnosed as being malnourished and dehydrated. Based on a comprehensive assessment of a resident, the facility must ensure that (1) a resident who enters the facility without pressure sores does not develop pressure sores unless the individual’s clinical condition demonstrates that they were unavoidable; and (2) a resident having pressure sores receives necessary treatment and services to promote healing, prevent infection and prevent new sores from developing. In pressure sore cases, photographs and/or videotape of the pressure sores are critically important to demonstrate to the jury the nature and severity of the injury. You should try to document the injury with photographs and/or videotape of the pressure sores immediately upon being notified that your loved one has a bed sore or pressure sore. If you or someone you love has suffered a bed sore, pressure sore, or decubitus ulcer while residing in a nursing home, the nursing home negligence lawyers at Suthers Law Firm would like to help. For a FREE consultation, please contact us online through our confidential evaluation form or call us toll free at 1.800.320.2384.